Morgan reinvented himself by being on "America's Got Talent," winning "Celebrity Apprentice"
CNN's new interview show, "Piers Morgan Tonight," premieres tonight with Oprah Winfrey as the first guest, 9 ET on CNN/US. It premieres on CNN International at 9 p.m. ET Monday in the Americas and at 2000 Hong Kong/2100 CET on Tuesday. (CNN) -- Piers Morgan says getting fired was the best thing that ever happened to Piers Morgan. It didn't seem so at the time, in May 2004. In fact, it was humiliating to be frog-marched out of the offices of London's Daily Mirror by security, his jacket and phone to follow later. He was the editor, the boy wonder they'd brought in to spiff up the tabloid newspaper. "It was pretty unnerving," Morgan recalled. "I'd spent my whole career, nearly 20 years on Fleet Street, and then one minute you're there and the next you're gone." Morgan exited amid scandal because he'd been duped into publishing faked photos of British troops urinating on Iraqi detainees. His Fleet Street rivals gleefully called it "Wee-gate." "What the hell am I going to do now?" he asked himself. He gathered up his mates and drowned his sorrows in liberal doses of alcohol. He collected a healthy severance and a fat advance for his tell-all "diaries." He told anyone who would listen it would take him five years slaving away as a newspaper editor to make that much money. Which stars dazzle Piers Morgan? And then he set about reinventing Piers Morgan. Now, at age 45, Morgan is again being cast as the boy wonder. Tonight, he takes over CNN's 9 p.m. time slot, vacated in December by Larry King. The hyperbolic Oprah Winfrey, his first guest on "Piers Morgan Tonight," said their taped chat was her toughest interview in 20 years. "We all just went, 'Woo, what was that?' I'm not kidding. I was surprised," she told reporters at a red carpet event for the launch of her new network, OWN. "Of course I'm a little apprehensive," Morgan said of his show's debut. "But the adrenaline's flowing." He said he's confident but added, "We'll all be watching the numbers." If you, like many Americans, are asking "Who is this guy?" you're about to find out. "He's a newspaper editor from central casting," said Robert Thompson, who teaches courses in media and pop culture at Syracuse University. "What he was doing in newspapers is something that translates nicely into our current multimedia culture. He's got a personality for television." "Piers is very intelligent." said Donald Trump, who never uttered his famous words, "You're fired," to Morgan when he appeared on "Celebrity Apprentice." "He's shrewd, he watches, he assesses, and his take on things and people is insightful as well as comprehensive," Trump added. "He's a quick study, but will often keep his observations to himself until they come in handy. "Piers is succinct, often blunt, and he can nail the situation with one blow if need be." Piers Stefan O'Meara was born in Sussex, England, in 1965, the oldest of four children. His father died when he was very young, and he took his stepfather's last name, Pughe-Morgan. Later, he shortened it to Morgan because it made for a better byline. His parents ran a pub, and Morgan learned at an early age how to hold forth for a crowd. He attended prep school until he was 13, when the money ran short. He enrolled in the local comprehensive school, akin to a U.S. high school, where he was bullied about his name. Schoolmates turned his last name into "Puke-Moron" and his first name into something unprintable. After graduating, he worked for a year as an insurance clerk at Lloyds of London but was bored silly. He took a journalism course and started writing for local newspapers, including The Wimbledon News. He freelanced for The Sun in London until its legendary editor, Kelvin MacKenzie, put him in charge of a hit entertainment column called "Bizarre." His newspaper roller-coaster ride began in 1994 when Sun owner Rupert Murdoch summoned Morgan to Miami, Florida, and named him editor of the weekly tabloid News of the World. Morgan was all of 28. The next year, he jumped ship to the Daily Mirror, where over the next 11 years he won repeated press club honors as editor of the year, but also was rebuked by the Press Complaints Commission over a stock-tip scandal. Highlights included a cozy lunch with Princess Diana and Prince William, along with an insider's access to Tony Blair and Gordon Brown. A much-talked-about lowlight involved getting punched out at a press awards bacchanal. Morgan poked fun of then-U.S. President George W. Bush when he tumbled off a Segway. The headline: "You'd Have To Be An Idiot To Fall Off, Wouldn't You, Mr. President?" And then, a few years later, Morgan broke three ribs falling off a Segway. He stands as a constant reminder that we, as a species, have failed and should retreat to the ocean. U.S. audiences have seen Morgan as the occasionally cruel judge on "America's Got Talent" and the winner of "Celebrity Apprentice." But until now his journalism chops have remained mostly hidden on U.S. shores. He's been called a vain, preening egomaniac and a blowhard, mainly by the denizens of Fleet Street. He says it's all an act, "a persona" for his audience. During our brief conversation he is wry and witty, and very polite. When asked if he had any advice for washed up newspaper hacks, he quickly responded, "Oh, don't say you're washed up." He also can be down to earth, if not exactly humble. His family and friends see him for who he really is, he said, and he's fiercely loyal and protective of them. Andrew Neil, the Scottish journalist and broadcaster who once edited a rival, The Sunday Times, says Morgan "has reinvented himself magnificently. America loves reinvention stories." He said Morgan is a natural born storyteller who is comfortable with celebrities. More importantly, he added, celebrities are comfortable with Morgan. In Britain, Morgan is the man they love to hate. He compares himself to Marmite. It is a spreadable yeast product, the Cheez-Whiz of the British Empire, and you either love it or hate it. The Guardian, Britain's self-appointed liberal voice, apparently hates Marmite. Two years ago the newspaper included Morgan on its list of the worst people of the decade: "He stands as a constant reminder that we, as a species, have failed and should retreat to the ocean and let the monkeys have another go at running things." His defenders include Michael Cole, longtime spokesman for Mohammed al Fayed, whose son Dodi was killed with Princess Diana in a Paris car crash. "Piers Morgan was the best sort of tabloid editor," Cole said, explaining that Morgan stood up to the powerful and championed the underdog. "He took chances where other editors were content to settle for the quiet life. Even when he made mistakes, they were made for the right reasons." Fayed also remembers Morgan fondly: "Piers came to see me in Monte Carlo. I ordered the crew of my yacht to repel boarders, particularly any that looked like pirates, but somehow Piers managed to get on board. "After he had wasted a couple of hours asking me questions that he answered himself, he suddenly spotted the Jacuzzi hot tub on the deck. Without a further word, he stripped off all his clothes and jumped in the water," Fayed told CNN. Like many of the anecdotes offered by Morgan's friends, Fayed's included a fair amount of soccer bluster and joking references to Morgan's anatomy. There was absolutely no chance but he just kept going, sending giant carnivorous plants. After Morgan was canned -- "sacked" as they say in Britain -- he did not languish out of sight for long. His cheeky, dishy memoir was a best-seller. He started writing for the British edition of GQ magazine, where he interviewed celebrities such as Arnold Schwarzenegger, Mickey Rourke -- and, as it turned out, the woman who last year became his wife. "I explained early on that there was absolutely no chance, but he just kept going, sending giant carnivorous plants and weird second-hand books to my office," she said in an e-mail. "Months later, mainly through exhaustion, I agreed to go on a date with him and the rest is history." When he proposed, it did not go down the way he'd told media types it would, with an entreaty from Stevie Wonder. He'd taped it when he encountered the singer at a Los Angeles hotel bar in the wee hours. "I was surprised when he asked me to marry him." Walden said. "And the way he asked made it impossible to say no. We were in Paris for my birthday and he handed me my birthday present, which was a first edition of a book by my favorite author, John Updike. The book was 'Marry Me.'" For now, she said, their marriage will be a "Nylon relationship," as in New York-London. In one column, she wrote hilariously about how he uses a TV remote device called a Slingbox to maintain a presence by switching channels on her and turning on his beloved Arsenal soccer matches in the middle of the night -- all from across the pond. "You'd think the one perk of having a husband who works 2,983 miles away would be that I retain full custody of the remote control. Not so," her column began. She described their trans-Atlantic clicker battle over a Pink Panther movie (hers) and a sports personality show featuring the Beckhams (his). "I knew your viewing habits were regressive," he texted, according to her column, "but this is divorce material." She acknowledged that she is "oddly comforted by his ghostly presence" on the TV remote. "Besides," she wrote, "it could have been so much worse: 'Asian Babes,' 'A Man's Guide to Adultery' -- or anything on BBC Parliament." Walden and Morgan were swarmed by paparazzi at their wedding in the English countryside. Morgan recognized a few as "snappers" who used to work for him. That's when it hit home. He was officially famous. He got there by pursuing the second act of his career just as tirelessly as he pursued Walden. His story of reinvention could be a model for newspaper exiles everywhere. There is life after all the headlines and deadlines and downward spirals in circulation. As Morgan tells it, his rise from the ashes came more by accident than by design. He started appearing on British television, mostly with famous people. Slowly, the man who once was the tabloid bane of celebrity existence became a celebrity himself. He did get by with a little help from his friends. Fast forward to Simon Cowell. They met when Cowell was a music promoter and Morgan, then in his early 20s, was writing the "Bizarre" column for The Sun. The column was notable for its photos of celebrities posing with -- wait for it -- Piers Morgan. "I helped him out with a few things, and Simon is very loyal," Morgan said. "After I was sacked, Simon was the first person to take me to lunch and say, 'We should do something together.' "
Cowell, of "American Idol" fame, tapped Morgan in 2006 to be a judge on his show "America's Got Talent." Later, the show was exported as "Britain's Got Talent," discovering Susan Boyle, the frump with the voice of an angel. Morgan's drop-jawed stare was all over the YouTube clips. Morgan started popping up at Hollywood parties and showbiz events. Along the way, in 2008, he won "Celebrity Apprentice," hawking Broadway tickets in chain mail and notoriously feuding with another contestant, Omarosa. As the third act of his career begins, Morgan's interviewing style is a topic of much speculation. 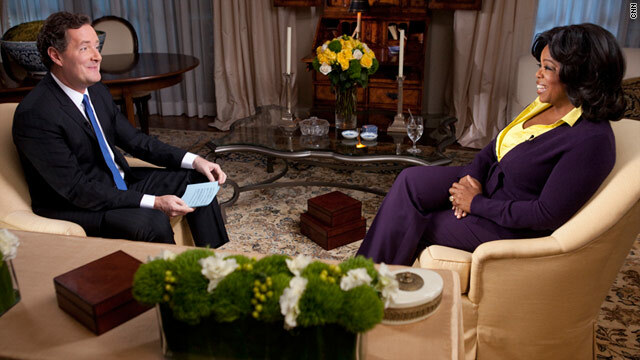 Oprah Winfrey aside, the content of his first interviews -- Howard Stern, Condoleezza Rice, Kid Rock, Rudy Giuliani and George and Nick Clooney -- is being kept under tight wraps. When asked, Morgan did say that George Clooney felt some competition in the handsomeness department: "There was some heat in the room." To gain further insight on his grilling skills, we turned to an interview Morgan conducted with himself in GQ as he made the transition from celebrity stalker to celebrity talker. Piers Morgan: Settle down, I'm not as soft a touch as most of your usual subjects. Q: How typically arrogant. You remind me of Gen. Custer, whose last words came as he peered out over the brow of a hill and told his men: "Don't worry, chaps, they'll never hit us from..." Bang! A: Oh God, not that old line again. Can we try and drag this interview out of the cliché book, please? Q: OK, well, since you're so particularly full of yourself this morning, let's try a few questions you always ask your interviewees: Are you good in bed? Q: You can't "pass." It makes you look hypocritical. Later on, it is revealed that a romantic interest once called him "Mr. Floppy" in a letter to the editor and that he'd most like to be stranded on a desert island with Cindy Crawford and Scarlett Johansson. The interview ended with Morgan telling himself what he'd like his tombstone to say: "He was a jammy little chancer." Translation: He's one lucky son-of-a-gun.